An ancient tradition tells that there were two children named Jesus, a year apart in age, born to parents called Mary and Joseph. These two Jesus children, brought up in close proximity, eventually 'united' in a mysterious way, resulting in a single 'Jesus' who was destined to grow up and fulfil the prophecies of the Old Testament. In grappling with this mystery, Nesfield-Cookson uses all available sources: the biblical accounts, New Testament apocryphal writings, Aramaic and Hebrew documents discovered in the Qumran caves in the twentieth century (the 'Dead Sea Scrolls'), writings by Syrian theologians of the thirteenth century, and in particular the statements by the philosopher and scientist Rudolf Steiner (the first in modern times to assert that two Jesus children existed). The author also refers to the many works of art - largely by Italian artists of the Renaissance period - which appear to depict two Jesus children. Fifteen of these paintings are reproduced as beautiful, full colour plates. 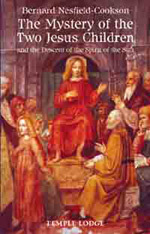 The author develops a parallel theme regarding the mystery of Christ and Jesus, that of the gradual descent of Christ - the Spirit of the Sun - from the spiritual world into a physical body. BERNARD NESFIELD-COOKSON led a varied professional life as a businessman, schoolteacher and writer. Most recently he was principal of Hawkwood College, an independent centre for adult education. He is the author of several books, including Rudolf Steiner's Vision of Love and Michael and the Two-Horned Beast, and has lectured extensively on Art and English Romantic poetry.